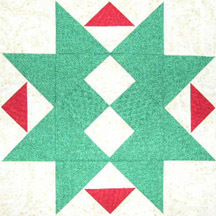 All the blocks for the Block Lotto in 2003 were STAR blocks, ranging in size from 8-to-16 inches square (finished size). 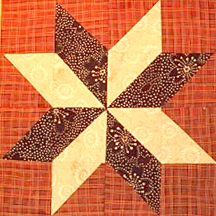 All the block patterns are found on the Quilter's Cache Web site. Because of waning participation in 2003, I decided to stop, but offered other Swap hostesses on the quilting forum an opportunity to take over. The one who did continued for part of 2004–if those blocks and photo are available, I don't have access to them, so there is no Lotto Block Index for 2004.